Two screenwriters are suing the independent Christian movie studio Pure Flix, alleging that the company stole the plot of their 2014 smash God’s Not Dead. The film starred Hercules actor Kevin Sorbo as an arrogant atheist philosophy professor who forces a Christian student to a series of debates on the existence of God. The professor says that if the student cannot prove God is alive, he will receive a failing grade. The professor is embarrassed into defeat in the third debate and subsequently is killed in a car accident, but not before converting to Christianity. Many noted at the time of the film’s release that the plot bore a resemblance to the Marine Todd meme, a story that had been circulating online since 2004, which described a Christian marine physically assaulting an atheist professor and “member of the ACLU” in a classroom. In the complaint, the plaintiffs note a series of similarities between the finished film and their own work, which they had shared with Ted Baehr, chairman of the Christian Film and Television Commission. They allege that Baehr disclosed crucial plot elements in a conversation with Pure Flix co-founder David White, who is named as a defendant. [A] young college student who has to debate a popular and charming atheist professor over the course of three debates, who struggles in the first debate, but succeeds in the next two after support and encouragement from characters including an unmarried local pastor, a rural married couple, the atheist professor’s wife who is also the professor’s former student (a lapsed Christian doing her own soul-searching) and an international student ally, and manages to persuade many others, including the professor, that God does exist. Plaintiffs note that in addition to the main plot, other elements can be found in both Rise and God’s Not Dead including the use of key phrases “God is good” and “God’s not dead,” and citations of certain theologians, scientists, and Christian apologetics arguments. 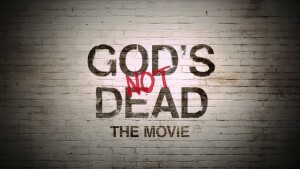 The film was followed by a sequel, God’s Not Dead 2, released in April of this year. Although a few minor characters were retained from the first film, including Reverend Dave played by White, it focussed on a new, unrelated story of a high school teacher being prosecuted by the ACLU for quoting scripture in a history class. Nevertheless, plaintiffs allege that the sequel is “at a minimum, a derivative work.” It is implied by a post-credits cliffhanger in GNG2 that Reverend Dave’s saga will continue in a third film. The scene shows him being arrested for refusing to comply with a subpoena to produce copies of his sermons.